Want higher ROIs on your Registered accounts? Looking for regular income from your investments? Are you trying to diversify your portfolio? The last half to a quarter of the year, we didn’t see the markets performing very well. likewise, I have had several clients that didn’t see healthy returns, if any returns, on their investments. Many are now deciding to turn to more of an unconventional way of investing – one that is not dictated by the financial markets. 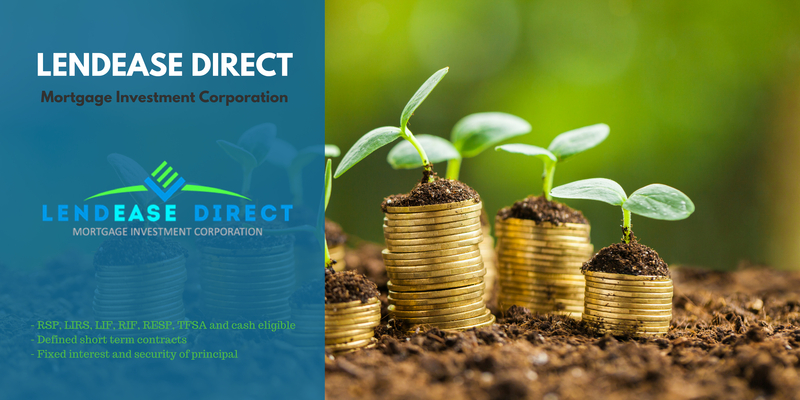 LED MIC offers interest in the form of dividends at 8% per annum to an investor. 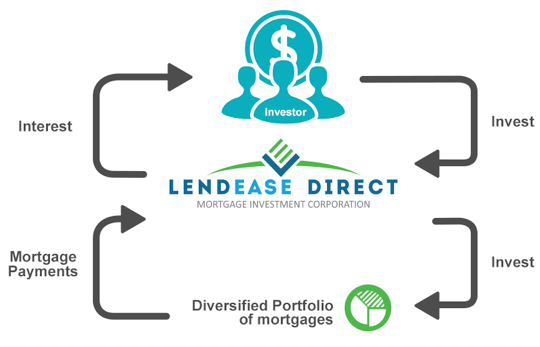 The investor purchases 50,000 shares of LendEase Direct at a par value of $1 per share. The shareholder would be paid $4,000 in dividends ($50,000 x 8%). With a MIC (Mortgage Investment Corporation) your money is pooled into a giant fund along with all the investor’s money. It is then lent out to borrowers on first and second mortgages. I like the idea that my investment isn’t tied to one borrower on one property. The risk is spread out over several borrowers and properties. I trust and value the underwriting guidelines of Lendease and appreciate that the equity in the property is always maintained. Meaning that, depending on the deal, Lendease always keeps a minimum of 20% equity in a property, most times much more than that. On average there is about 35% equity left in the properties we lend on. From my own personal perspective, I try to consider what would cause me to lose money? From my personal perspective, I think a) a large number of our borrowers would have to walk away from their loans. b) Lendease would then have to be in a position where they couldn’t sell those properties in order to pay back the loan. From my perspective, for this to happen the real estate market across Canada would have to take a dip by at least 30% or more. I figure if this happens then all the other financial markets (and investments) will be down too. It’s a rate of return of up to 8% and this return doesn’t fluctuate with the financial markets. It’s simple math! I earn 8% because they are charging more than that on the mortgages they give. Plus I have the potential to earn an additional dividend if there are extra profits left in the company. All shares are of the same class. Meaning my shares have the same value as the President and as Joe Blow off the street. If anything did go sideways and Lendease needed to fold, I have comfort in knowing that all shareholders are paid out equally (not just the big guys at the top). There are several ways that you can start investing with Lendease. If you have any registered account you can simply transfer them over. This applies to RSP’s, RESP’s, TFSA’s, RIF’s, LIRA’s ect ect. You can open up a new registered account in Lendease or you can do a cash investment as well. Our EMD (Exempt Market Dealer) would love to chat with you further and determine if Lendease Direct is for you! Give me a call (403-307-2002) and I can make arrangements for you. One investor was 71 year of age and at the point where she needed to covert her $100,000 RSP into a RIF and begin to take it out. She inquired with her banker (as the RSP was with a major bank) and was advised that she could amortize the RIF out over 25 years and she would earn roughly $350 a month for the 25 years and then it would be gone. She instead moved her $100,000 over to Lendease and takes her interest via direct deposit of $666 monthly. This is never touching the $100,000 principle and she was able to leave it to her grand-daughter as the beneficiary. Another client recently retired and sold his business. He took the profits from the sale of $650,000 and invested in Lendease. Because he is now retired be takes out the monthly interest of $4333.33 and this is a large part of his retirement living expenses. Let’s see what your funds might look like in a Lendease Direct investment!